Organize and store your bobbins in one tidy location. â€¢ Constructed of natural, durable hardwood. â€¢ Accommodates up to 32 standard sized bobbins. â€¢ Conveniently stands on flip-out legs or hang on a hook. 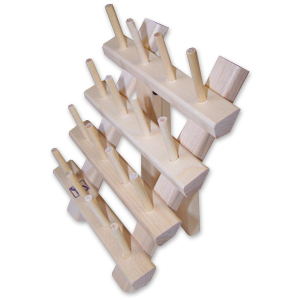 â€¢ 1-1/8â€ spindles with 1-1/8â€ spacing. â€¢ Overall dimensions: 5â€ wide by 6-1/2â€ high.